Number of pages: 487 p.
During the highly competitive initiation that follows, Beatrice renames herself Tris and struggles alongside her fellow initiates to live out the choice they have made. Together they must undergo extreme physical tests of endurance and intense psychological simulations, some with devastating consequences. 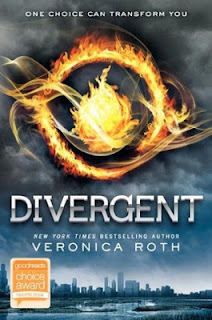 As initiation transforms them all, Tris must determine who her friends really are. I might be a little late at the party with this one, but I just had to tell you how awesome this book is!!! It like the books I read this year are getting better and better and better, and better. I could go on forever I think, because I read one awesome book after another! I have to tell you though I was a bit anxious to start this, another dystopian, because I thought it would be similar to Matched, but I was very wrong! This book is nothing like Matched! Totally different world and full of action! It's great, its like one rollercoaster ride after another, adrenaline reeling through your body, every step of the way. This book was intense in a good way! Tris is this power house heroine, she is very likeable, and easy to relate to, I like here a lot, although I don't like her real name Beatric, sound a lot like our former queen. And then there is Four/Tobias *sighs* he is sweet, smoking hot, and a real "warrior". The relationship between Tris and Tobias, develops slowly, deepening when they find out each others secrets, it felt realistic, not instant, which is wonderful! This book has a variety of interesting side characters, her friends Christina, Will and Al, are all very divers in personality and are well thought-out. One character that sparked my interest was Uriah, a Dauntless born, I liked him a lot, and I found it very interesting that he like Tris so much, while most of the other Dauntless born didn't because she came from Abnegation. Oh, he reminded me a bit of Seth (from Twilight), because of his sweetness and enthousiasm. Tris managed to turn everyone's opinion around in a flash. Like I said power house! I like it! Always have. This book has changed my opinion about the dystopian genre, this is becoming one of the most interesting and favourite genres of mine. Another thing about dystopian worlds is that there is always some economical/political angle to it, which makes you think about the world we live in know. This book is awesome, it has great world building, is suspenseful, full of action, it has wonderful first love, conspiracies, and family. All these elements you will find in this wonderful book! That is why this is an 5 star read! This is the reason the book is called Divergent. And ofcourse miss music has music for you! Three songs to be exact. Yes Three! You read that right. The first is Muse, Neutron Star Collision, this song describes the relationship between Tobias/Four and Tris. The second is Imagine Dragons, Radioactive, just because the beat fits with the action in the book! (Oh and it is kind of my favourite song of the moment). The last is the song for the last part of the book, the revolution, this is a song by White Lies - Bigger Than us. The title says it all, also the energy in this song also fits the book very well. Goede review! Heb je Insurgent al gelezen?